We will be offering lots of new exciting cocktails and foods over the 2 nights so make sure to come thirsty and hungry to check out the comfort treats. Josephus Bartin? A Bangkok resident and nature lover will be opening his unqiue animal appreciation art exhibition with some fun and entertainment thrown in for good meausre. (The art exhibition will run until August 2nd 2015.) Colourful, humourous and expressive, his art will have you smiling in no time. Followed by Re-Screening of Rob Stewart?s award winning film Sharkwater?. Acclaimed Thai photographer and shark specialist Shin Sirachai Arunrugstichai? will be presenting his shark research before the FREE Revolution**? 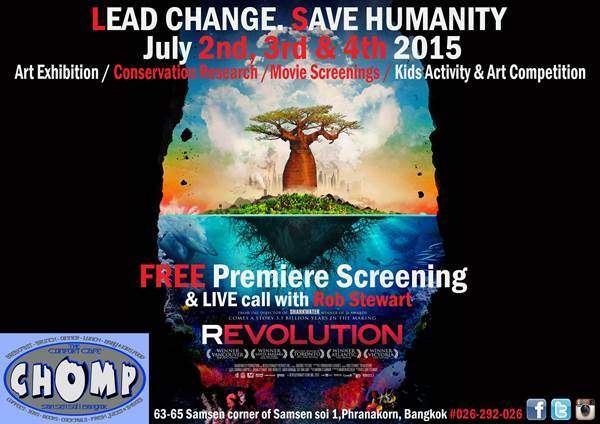 screening followed by a LIVE Conference call with Rob Stewart himself!!! Bring the little ones from 1pm as Kids get creative with animal art and activities with Candy Chloe? Heads and Tales - Storytelling and Crafts for Children? and an art competition. Please let children around Bangkok know that they can either come and make art on the day or made before and brought from home - any animal is the theme! Great prizes to be won. Please contact me for further info or to make a reservation. Many Thanks in advance for any coverage on this 1 time only event in old town Phranakorn. **For more info about this film - please read below.